Dr. Reber is an Associate Professor of Archaeology in the UNCW Anthropology Department. 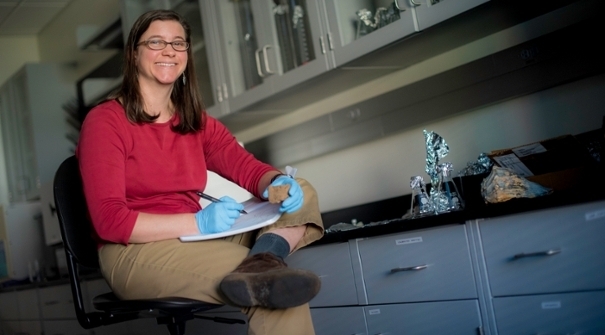 Her research interests include archaeological pottery residues, the coastal archaeology of North Carolina, agriculture and plant domestication, archaeobotany, mass spectrometry, stable isotopes, American Bottom archaeology, the Mississippian emergence, and the archaeology of the African diaspora.. Her lab, the UNCW Pottery Residue Lab, is a dedicated facility for GC/MS analysis of absorbed and visible pottery residues. Her dissertation, Maize Detection in Absorbed Pottery Residues: Identification and Archaeological Application, applied compound specific stable isotope analysis to develop a new technique for the identification of maize compounds in archaeological pottery residues. This page is always under construction. What else is new?